What a nice surprise! A friend of mine notified me earlier this week on Facebook that he found my picture “Distant Rain Shower” in issue 01/2016 of the German nature photography magazine NaturFoto, on page 71. 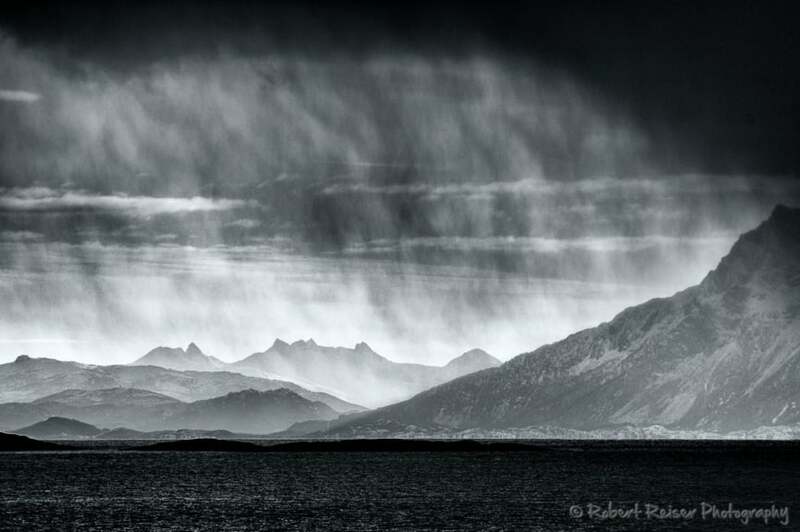 The picture was published in the reader’s gallery, the topic was “Bad Weather” (schlechtes Wetter). To be honest, I was not aware of the publication. I did submit the picture back in November and never heard back from the magazine. They were even creative enough to write their own text for my picture ;-). Nevertheless, I do feel honored about the publication. Update on 2016-01-19: The day after I wrote this article, I did receive a letter from the magazine publisher together with a complimentary copy of the magazine and a voucher for an online training platform. Very nice! The picture was taken during a trip to the Lofoten istands, in February 2013. I took it from a boat, as part of a sightseeing cruise. The cruise did not start too well, to be honest. We were in the middle of a snow storm, and the visibility was below 10 meters. But after about 30 minutes, the sky cleared up. In the distance, I could see the shoreline with heavy rainfall or snowfall right in front of it. Since the boat was moving on, I only had a few seconds to capture the rainfall in front of the shoreline. Of the pictures I took from that scene, I likes this one the best because of the virtual “frame”. There was not too much color in the picture anyway, and I knew immediately I would convert it to black & white. Using Nik Silver Efex 2, my favorite tool for Black and White conversions, only a few contrast tweaks were required to finish the post-processing.